A CONVERSATION ABOUT DIVERSITY, INCLUSION, LEADERSHIP, AND PARENTHOOD. We are honored to have been able to host a fireside chat with Margaret Mueller, newly installed CEO of The Executives’ Club of Chicago. Over one hundred of Chicago’s greatest HR leaders and D&I professionals gathered to hear all about Margaret’s background, goals, her new role, and the Exec Club’s mission to foster a diverse and inclusive environment. The event was kicked off by Tonise Paul, Chair of The Executives’ Club of Chicago and CEO of Energy BBDO, and Dorri McWhorter, CEO of YWCA. Margaret shared that when she left her last position, her plan was to take a year off from her career and focus on finding new opportunities, after having served on a team for fifteen years. However, just a few weeks into her year-long break, she was given the opportunity to learn more about The Executives’ Club and found herself having many conversations and becoming very excited about — and ultimately receiving — the chance to lead the organization into the future. 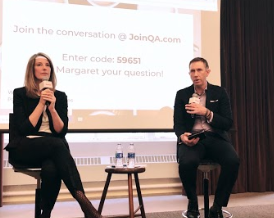 When asked why the world and city of Chicago needs the Executives’ club, Margaret expressed that people are in search of more meaningful connections. She stated that The Executives’ Club of Chicago does just that, bringing people together from different industries to help one another grow. Margaret outlined that one of her goals as leader of the organization is to make the Club accessible and inclusive to small and mid-size organizations, rather than just Fortune 500 companies. She mentioned the recent member and alumni survey that Holistic conducted for the Club, and talked about two findings that spoke to the potential for the club to be an inclusive, inviting place — members rated their own personal interest in D&I at 8/10 and rated the “welcomingness'“ of the club as 8.3. (To view a couple findings from the report, click here). Margaret also shared her experience being a woman in business in our city, stating her belief that we need better balance in supporting women to expand and grow their careers. She discussed, at length, her family dynamic, and how she and her husband, Dave, work together to create a fair and equitable environment, support one another, and raise their twin sons in an optimistic, forward-looking home. “The greatest feminist gift I can give to society is raising two really great boys,” she said. Read what Margaret had to say about the mayoral race in Chicago and the future of The Executives’ Club of Chicago here. Connect with Margaret here and learn more about The Executives’ Club of Chicago here. If you’re interested in attending one of our future events, check out our events page and make sure to subscribe to our newsletter for special invites and more. If you’re interested in participating in an event with Holistic or for sponsorship inquiries, click here.